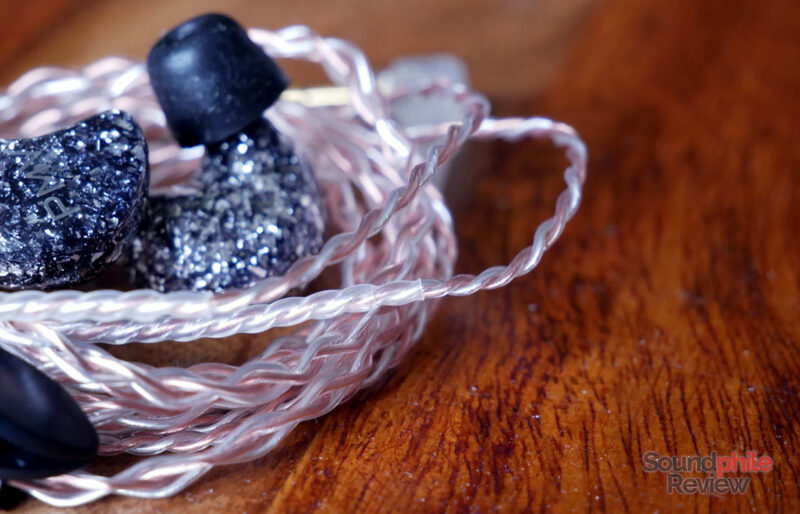 PMV’s Crescent balanced armature-based earphones are probably the brand’s first product to claim wide notoriety, also thanks to a drop on Massdrop. Launching at almost $400, the PMV Crescent 8BA are more affordable than the average for earphones with eight balanced armatures. 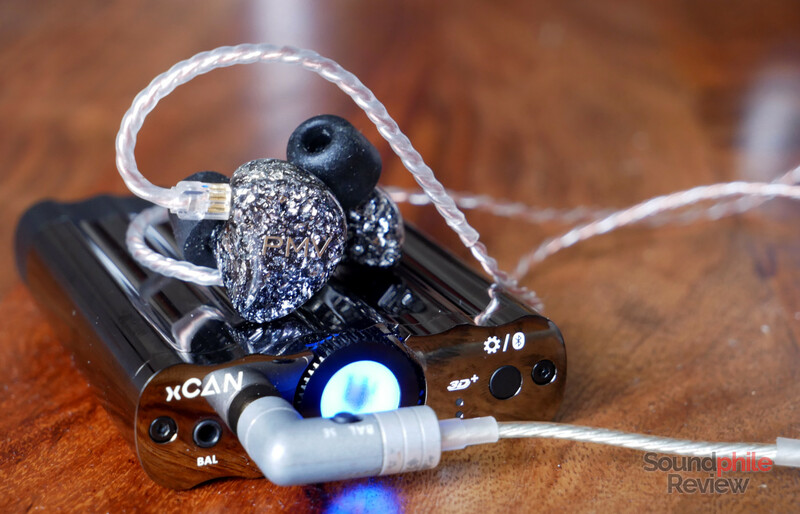 Their peculiar tuning is warm and relaxing – not really the signature of usual balanced armature earphones. Disclaimer: Linsoul Audio sent me a complimentary unit I won’t have to return. They sell them on their website and AliExpress at $379. When I received the PMV Crescent 8BA I thought that they leave nothing to looks, concentrating on substance – even thought the presentation is surely bold. They arrived in an anonymous shipping box covered in tape, which then contained the smaller waterproof case of the earphones. Nothing else was included – so there was no traditional packaging for the Crescent 8BA, which is highly unusual. The case they come in is really nice, though, and makes up for the lack of a traditional box more than adequately. It is large and heavy and seems to be built to withstand a lot of abuse – it’s solid as a rock. 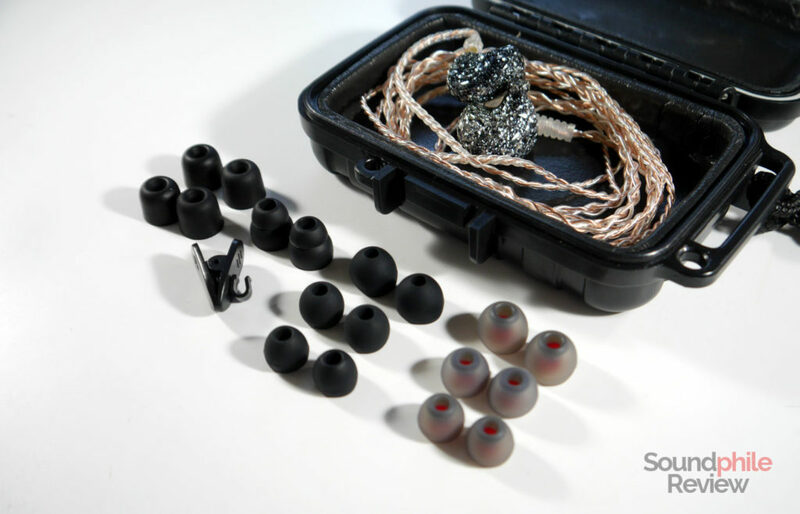 It contains the earphones with the removable cable pre-attached, a cable clip and a set of eartips that includes two pairs of foam tips, a single pair of double-flanged tips, three pairs of black silicone tips and three pairs of dual-density silicone tips (with transparent grey dome and orange inner boring). The first impression given by the case was then immediately superseded by the opposite one when I opened it. Do you like sparkles and flashes? Well, the PMV Crescent 8BA offer plenty of those. They’re certainly really flashy in their looks, almost showy – but they keep a certain elegance that does not make them excessive nor gaudy. 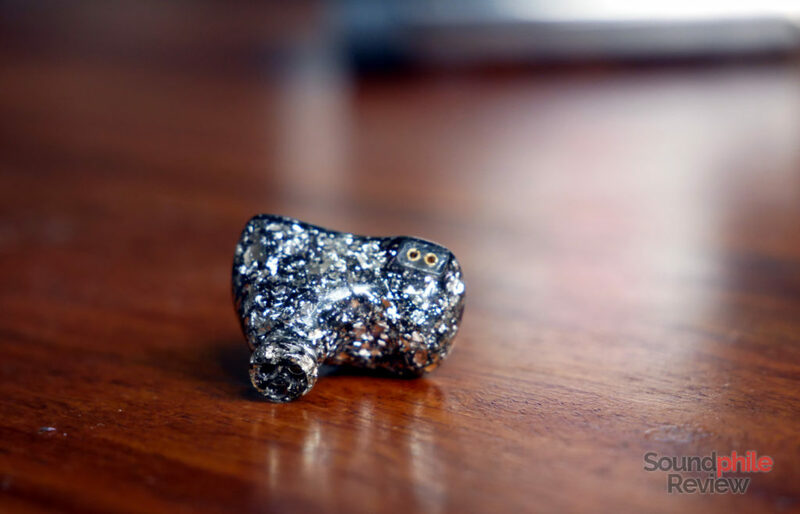 The shells are made of resin in a mix of black and silver flakes, so the resulting look is really variegated and unique to each earpiece. The PMV logo, which seems to be made with a sheet of metal, is placed on the faceplate. 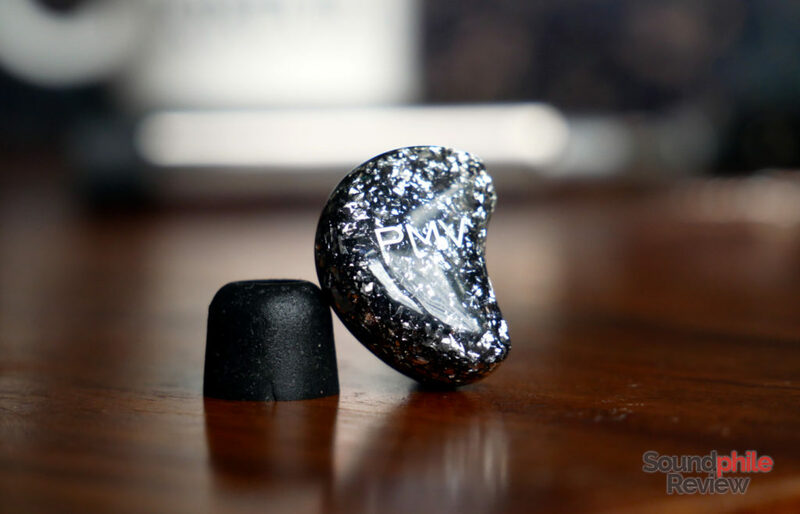 The PMV Crescent 8BA use eight balanced armatures that are encased in resin – and as it is matte, you can’t see them – but despite this high count, the earpieces are relatively small and comparable in size to earphones with a lower count of drivers. The nozzle is made of solid resin, too, and it has three different holes: that’s because the three groups of balanced armatures inside have a hole each to only make the sound mix when it’s already in the ear canal. I can’t say whether that makes any difference from an acoustic standpoint, but it makes it less probable than dirt enters the holes as they’re quite small. Thanks to the use of resin, the PMV Crescent 8BA appear solid and durable. They’re also well refined, with no seams or other signs of the production process. The shells have a glossy finish that’s really beautiful but also a fingerprint magnet. The PMV Crescent 8BA are highly isolating earphones, when using the right tips. The use of solid resin for the housings seems to help in this regard and the result is that outside noise – especially lower frequencies – is attenuated to the point it’s barely audible, save for the loudest noises. The cable is made of four cores, two in copper and two in silver. Each core is individually sleeved in transparent plastic, so what you see is the actual core. The four cores are braided up to the Y-split, and then they separate into two groups of two that are just intertwined. This is a pretty standard configuration, but it’s one that’s more often seen in lower-tiered products: earphones in this price range usually opt for eight or more cores. This takes nothing away from the fact that it is a finely made cable. All the junction boxes (jack, Y-split, 2-pin connectors) are made of transparent plastic which exposes the cable inside. The 2-pin connectors are pretty tight and getting them in (or out of) the earpieces is often problematic: relatively large force has to be applied in order for the cable to move, and it made me a bit worried when I first tried it. I reviewed the PMV Crescent 8BA while away from home, so I had to use portable equipment. That includes a Cayin N5ii, an xDuoo X10T II which acted as a source for an RHA Dacamp L1 and an Audirect Beam (connected to my notebook). Thanks to the low impedance of 19 Ω and the high sensitivity of 113 dB, the PMV Crescent 8BA can be driven by any source – they are definitely not power hungry earphones. They are, however, picky about sources as the combination of low impedance and high sensitivity makes them prone to be influenced by the output impedance of the source: if that’s too high, they become bassier than ideal. They’re also prone to show hisses and other background noises. As the name suggests, the PMV Crescent 8BA have eight balanced armatures inside them: four are dedicated to bass and are in twin configuration (so they two double drivers), two are dedicated to midrange and two to highs. What I really did not expect was the width of the soundstage. Despite the PMV Crescent 8BA being closed-back IEMs, they sound almost like they’re open-back. The key is in this “almost”, as they are not really as wide as open-back headphones, but they’re still noticeably wider than average and among the widest I have ever tried. The sound plays on a stage that’s wide and deep, so it appears to extend in a large space. The PMV Crescent 8BA are definitely good in technical ability, as they can separate instruments really well while placing them with good accuracy across the soundstage. Even in crowded, complicated tracks one can clearly hear the different parts, though the higher-pitched instruments are more difficult to follow due to the way the earphones are tuned. This ease is also made possible by the imaging, that places instruments in different spots across the soundstage and makes it possible to concentrate on a specific instruments by listening to it according to its position. The PMV Crescent 8BA are relatively neutral in their tuning, but the way treble is recessed makes them sound warm. They do have a few quirks that diverge from a perfectly neutral signature, though, and which make them quite unique in the way they present sound. Bass is lean and refined, with the right amount of presence to be clearly audible and provide body to the sound, but it never goes beyond that. It is mostly inoffensive and almost low in its presence, but on the other hand it is clean and clear. It is not really deep, reaching only 50 Hz with decent presence, and neither is especially emphasised nor punchy. It is the classic bass you get from balanced armatures: almost no physicality, low presence in the lowermost range and very good speed with fast decay. There is more presence in the mid-bass region, but it’s still limited. All this leads to a very clean, yet a bit anaemic bass presentation that won’t be good if you are craving for punch, involving and fun bass – it’s more geared towards accuracy. In that regard it is rather good as it offers a very good amount of detail: bass always appears cleanly cut, with good layering and many small details that are clearly laid in front of the listener. Midrange is definitely the most complicated area to describe in the sound of the PMV Crescent 8BA. Although it is overall neutral, it has some peaks and dips that deviate substantially from neutrality and give it an odd tuning. My impression is that there are a couple of main peaks: one is the central section, while the other is more towards the upper area. There is an area between the lower mids and the middle ones that appears recessed, and that recession is replicated between the middle and the higher areas. This makes for a very odd tuning which makes some instruments pop out from the rest (e.g. the guitar at the beginning of Hotel California and the electric guitar just after the introduction) while others remain a bit more in the background (e.g. the voice in the same track). The overall impression is that midrange as a whole is a bit recessed and on the warm side. The detail is very good and the same speed found in bass is present here. Treble is definitely laid back and even a bit too polite. It is in fact only clearly audible in the lower part of the range, as it then rapidly rolls off and is therefore not really present going up. Its extension is south of neutrality and offers very little presence in the uppermost region. This impacts on the airiness and perceived spatiality as well as on the perceived amount of detail and depth. Treble is “warm” as only the lower area is clearly audible, so it does not sound really open and wide. Detail is good, but not extremely accurate as the finest details do not appear as well refined partially due to the lack of presence of the upper range. It is really inoffensive, but pleasant as it conveys the necessary information while being discreet – it is definitely relaxing and unobtrusive. Fearless Audio S6 RUI: the Fearless Audio S6 RUI are probably the most balanced in the bunch and the most technically achieved. Bass is noticeably deeper than on the Crescent, with comparable presence; midrange is more even and therefore more neutral; treble is more present and extended. The end result is that the S6 RUI sound more neutral than the Crescent 8BA, but the latter are more relaxing. The soundstage of the Fearless Audio IEM is a bit narrower, but imaging is more precise and instrument separation is superior. Toneking T88K: the T88K are way less warm than the Crescent 8BA, with less bass, forward mids and more treble. They are in fact more mid-centric than the Crescent, with bass being more recessed and similarly deep, midrange being more towards the front (with emphasis on the upper range) and treble being a bit more emphasised but with similar extension. We might say they are more “A” shaped. The soundstage is larger and deeper on the Crescent, with imaging being comparable and instrument separation being better on the T88K. The latter also deliver more detail. BGVP DM6: though both strive towards neutrality, the DM6 are a bit more U-shaped than the PMV Crescent. They offer noticeably more present treble, with more extension and better perceived detail; the midrange also sounds a bit more forward, with the upper range that is a bit more emphasised, and bass that’s largely comparable in terms of presence but more extended. The PMV end up being warmer and more laid-back, while the BGVP are more complete and engaging – especially if you look for more presence in the upper area. In terms of technical ability I would rate the PMV as superior in terms of soundstage, but comparable in imaging and just slightly superior in instrument separation. The idea that a driver type would dictate the tuning of headphones has always escaped me and the PMV Crescent 8BA are a good proof that it really depends on how you tune those drivers. Despite using only balanced armatures, they sound warm and relaxed, almost like a Sennheiser HD 650. They’re really good from a technical standpoint and this makes them a good option for those who wish to listen to their music without any trace of fatigue (and/or who prefer a warmer sound).